Sorry I haven’t posted in a while, I’ve been fighting a nasty sinus infection but I’m starting to feel almost normal. Who wouldn’t want this added to their dessert table. Trust me, you will be the hit of the party if you bring this with you. I had made another recipe a few years ago but I thought it had too much liquor in it and the texture of the cream wasn’t light enough. This recipe uses whipped cream instead of whipped egg whites so I was a little concerned because I reeeally, reeeally don’t like whipped cream but it worked fine. I even froze the leftovers and they tasted just fine after defrosting. There was no degradation in flavor or texture at all. The only thing I found is that you need to play with how long to dip the Savoiardi biscuits. I think it just depends on the density of the brand you’re using. At most I would dip them a few seconds on the bottom side and then place them upside down so the liquid soaks into the remainder of the biscuit. Step 1: Start heating water in a double boiler to boiling. You can use a medium sauce pan to hold the water and top with metal bowl to hold the ingredients to be heated. Add the egg yolks and sugar and mix well. Turn heat to low and stir for 10 minutes. Step 2: Remove egg yolks from heat and beat for a few minutes. The mixture will thicken and become a lighter yellow. Step 3: Beat mascarpone into egg yolk mixture to combine. Set aside. Step 4: In a medium bowl, beat cream until it becomes thick and holds stiff peaks. By this time the egg yolk mixture should have cooled a bit. Fold whipped cream into the egg mixture. Set aside. Step 5: In a small bowl, combine the espresso and liquor. Use a couple of the Savoiardi to determine how they will soak up the liquid. Dip one quickly for a count of three and then turn it upside down in a small dish. Wait a few minutes and cut the lady finger to see how much of the espresso mixture has soaked into the lady finger. If it’s to your liking, then use this length of time to dip the Savoiardi. If not then, dip one for another test for a little longer or shorter to find out the length of dipping time that works for you. Once you’ve found your favorite dipping time, then dip the lady fingers for the appropriate length of time, and invert them and place them in the bottom of an 8 inch square pan to cover the bottom of the pan. Step 6: Cover the layer of Savoiardi with half the mascarpone mixture. Spread evenly. Step 7: Create another layer of dipped Savoiardi. Cover the second layer of Savoiardi with the remaining mascarpone mixture. I had several Savoiardi left over but I didn’t mind because I would rather have more of the cream in the dessert anyway. Step 8: Place mixture in the fridge for at least four hours. Use cocoa or ground chocolate to dust the top before serving. Tips: Tiramisu freezes wonderfully if you’re lucky enough to have any remaining. Defrost for half an hour before serving. 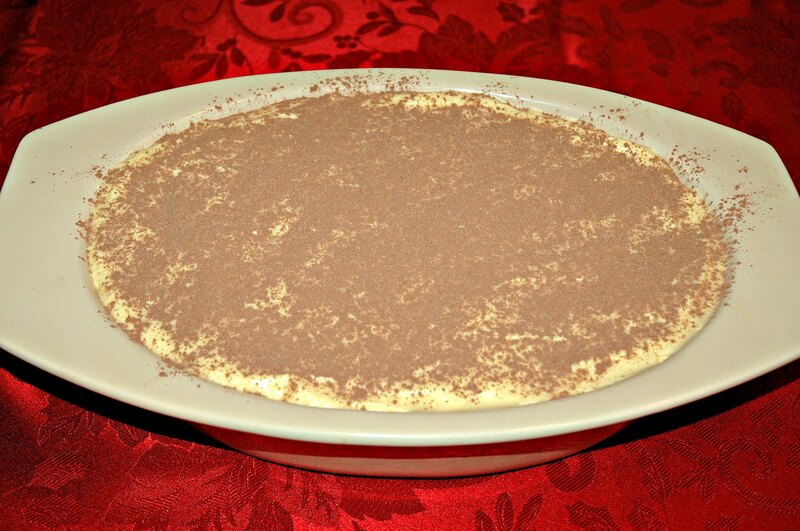 Recipe adapted from Chef Dennis, The Best Tiramisu You Will Ever Make. This entry was posted in Dessert and tagged egg yolks, mascarpone, Tiramisu, whipped cream by Annamaria @ Bakewell Junction. Bookmark the permalink. 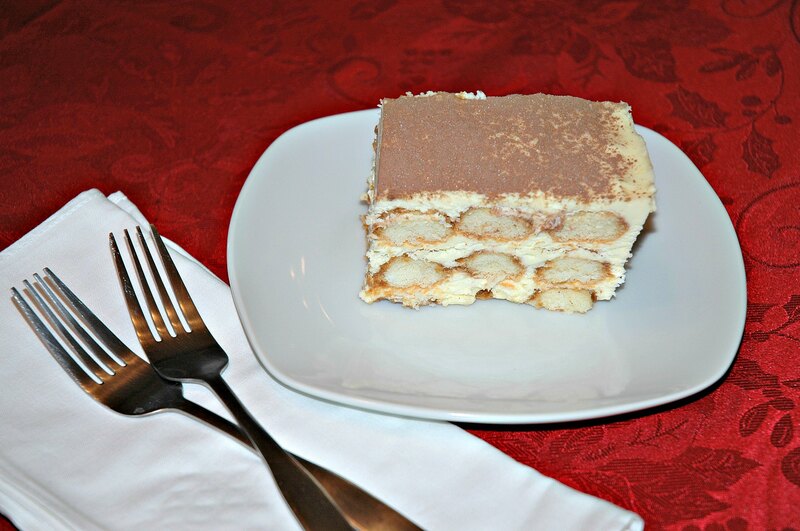 I LOVE tiramisu and this sounds so easy and delicious! YUM! This looks delicious! Dropping by from Tasty Tuesday link up! My favorite dessert! Hope you are back on the mend! Following from Together on Tuesday! 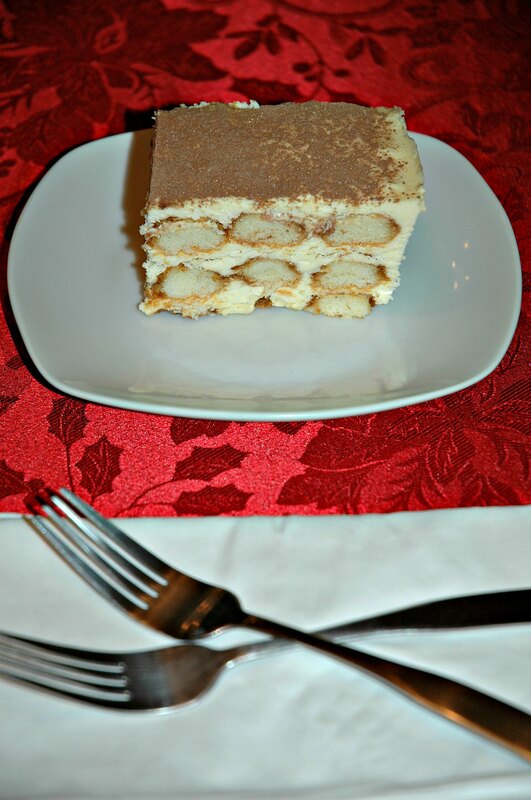 Tiramisu is my absolute FAV dessert EVER! My Grandma use to make it for me all of the time when I was younger and I have and use her recipe that has been handed down for many generations in our family. The only thing that really stinks about the recipe is that some of the ingredients are almost impossible to find here In the Phoenix Metro area! Back in New Jersey it was never an issue! 😦 I am going to try combining my family recipe and this one and see how it turns out. oh, I love Tiramisu. Have to try making it soon. Thanks for linking up to the Pins of the Week Party! I’m pinning this! We’d love to have you link up again and with a pin to make it easier for pinning and sharing! Tiramisu is something I order when we’re out, but that I’ve never made at home. Pinning to try it soon. Thank you for sharing the recipe, Annamaria, and for linking up at the Thank Goodness it’s Thursday party. Tiramisu is one of those desserts that I have never tried to make myself, but have always wondered about doing. You have laid out a wonderful tutorial with your recipe, and the Tiramisu looks delicious! Thanks for sharing at the #HomeMattersParty 🙂 Hope to see you again next week. Looks SO good! Glad you’re feeling better! Thank you so much for linking up at Tasty Tuesday! Your recipe has been pinned to the Tasty Tuesday Pinterest board! Please join us again this week! I hope your are feeling better from your sinus infection. I had tiramisu once in Italy. This is really pretty. Thanks for linking up to Tips and Tricks. Hope to see you again next week. What a great dessert! Love it! Pinned and tweeted. We love to party with you, so I hope to see you tonight at 7 pm. That would be so awesome. Yum! I love finding great new recipes! Thanks so much for sharing at Talented Tuesdays – I hope you are feeling better! Glad to hear you are feeling better. Being sick is never fun. This dessert looks delicious. Thank you for linking up to the Let’s Get Real Link Party! This looks amazing. Right up my sisters alley. I have never had tiramisu but this looks totally doable! I hope it tastes as great as it looks… off to the kitchen! Thanks for sharing on the (mis)Adventures Mondays Blog Hop. I can’t wait to see what you share next next time! This looks delicious, I like tiramisu a lot. Thanks for linking up to Sweet and Savoury Sunday, stop by and link up again. Have a great day!! I’ve always wanted to make tiramisu but it’s one of those things that I find intimidating. Sorry about the sinus infection. I’ve been fighting with a nasty cold the past couple of days.